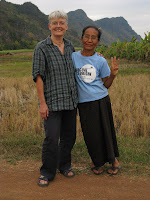 One of our goals for this trip is to get a sense of where handweaving is going in Thailand. We've been discussing this with our Thai friends and some of the weavers we meet. The conversation is never a simple one as the topic is situated in the larger issue of industrialization and modernization in a 'globalized' world. And, of course, as elsewhere in the world, the global economic downturn is affecting people in Thailand. An article in the Dec. 21, 2008 Bangkok Post (Thailand's biggest English-language daily newspaper) caught our attention and confirmed what our friends here have been telling us for some time. Entitled "Growing debt forcing rice farmers to put their farmlands up for sale," the article discussed how skyrocketing rice prices did not offset the rising costs of farming (higher production costs, including fertilizer, pesticides* and land rental costs) because most of the price rise went to millers, wholesalers and exporters. At the same time, everyone in Thailand eats rice as their staple food, so any increase in the price of rice results in inflation across-the-board. So, almost everything has gone up in price -- except factory wages where, instead, there have been significant layoffs, especially in the auto (and related) industry. The director-general of Thailand's Rice Department said that "in order to find a way out of their debts, many people have decided to sell their farmlands and leave the villages for the cities in search of jobs in the hope of finding a better future." Most of the weaving groups we buy from are village-based groups, which means they primarily make their living by farming, usually farming rice. 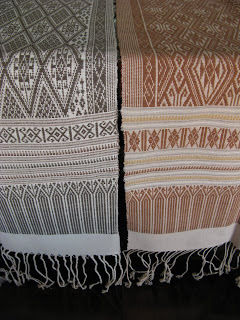 The future of handweaving in Thailand is very much connected with these trends. Fewer and fewer women in the villages are continuing to weave. Some are leaving the villages for waged labour. Younger women are not continuing their foremothers' weaving traditions for a number of reasons, including a drive to modernization that values this work less. The cost of materials is rising, including cotton and silk yarns that must be bought from the market or from other groups. 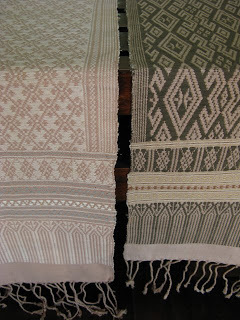 Thai customers are less interested in traditional weaving than before, and generally have less money to spend on it. So, while international markets become more important, village women are not any better suited to reach them, due to enduring limitations of cultural, technical and language skills. While we continue to build relationships with the groups we already know and buy from, we're also finding new groups and new designers so we can bring fresh work home with us. We plan to make these available through the special textile fairs that we organize, through the events that we're invited to speak at (check our website under "Services" for more information) and through our online shop. We hope you will help us support Thai and Laotian weavers by buying their wonderful handwoven pieces when we bring them back with us! * Note: We try to buy organically produced textiles as often as we can find them, so we support the weavers' attempts to keep their costs down and to lower their exposure -- and that of their environments -- to harmful chemicals.